Hot Drink Cups Offer A Pla Inner Lining To Ensure A Leakproof Seal Without The Use Of Conventional Plastic. Lining Is Made Of A Plant-Based Resin. Smooth Rolled Rim Ensures Comfortable Use And A Secure Lid Fit. The Exterior Design Features A Map Of The World With The Land Masses In White. 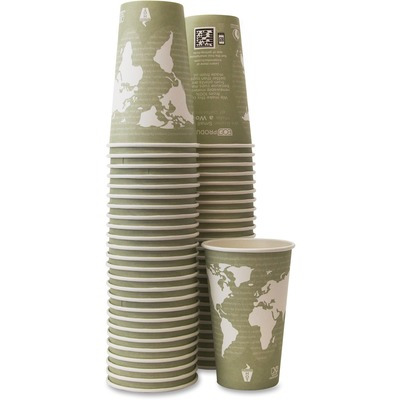 Cups Are Made From Renewable Resources Including Paper, And With An Inner Lining Made With Ingeo Biopolymer, A Natural Plastic Made From Corn. Bpi Certification Verifies That Environmental Claims Have Been Validated By An Objective Organization. Paper Hot Cups Are Not Recommended For Microwaves..